The history of the civil rights movement is commonly illustrated with well-known photographs from Birmingham, Montgomery, and Selma-leaving the visual story of the movement outside the South remaining to be told. In North of Dixie, historian Mark Speltz shines a light past the most iconic photographs of the era to focus on images of everyday activists who fought campaigns against segregation, police brutality, and job discrimination from Chicago, Milwaukee, Pittsburgh, New York, Detroit, and Los Angeles to Seattle, Des Moines, Wichita, and Spokane. With images by photojournalists, artists, and activists including Bob Adelman, Charles Brittin, Leonard Freed, Diana Davies, Matt Herron, Gordon Parks, and many others, North of Dixie offers a broader and more complex view of the American civil rights movement than is usually presented in books, television, and film. 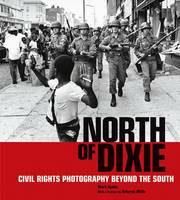 North of Dixie also considers the camera as a tool that served both those in support of the movement and against it. Photographs inspired activists, galvanized public support, and implored local and national politicians to act, but they also provided means of surveillance and repression that were used against movement participants. North of Dixie brings to light numerous long-forgotten or previously unknown images and illuminates the multifaceted story of the civil rights movement in the American North and West. MARK SPELTZ is an author and historian who writes about civil rights photography, vernacular architecture, and Wisconsin culture and history. He is currently a senior historian at American Girl in Madison, Wisconsin. DEBORAH WILLIS is chair of the Department of Photography & Imaging at the Tisch School of the Arts at New York University. She has been the recipient of Guggenheim, Fletcher, and MacArthur fellowships and was named one of the "100 Most Important People in Photography" by American Photography magazine.